WHITE QUESO DIP IS MEXICAN RESTAURANT QUALITY SMOOTH AND CREAMY DIPPING CHEESE. THIS DELICIOUS TEN MINUTE RECIPE IS PERFECT WITH FRESH TORTILLA CHIPS, SPOONED OVER YOUR FAVORITE BURRITO OR POURED OVER STEAMED BROCCOLI. If your family is anything like mine than one of the highlights of visiting your favorite Mexican restaurant is the white queso dip! This simple recipe can bring that creamy smooth dip right to your kitchen. We love this easy white queso! The endless uses for this delicious dip are only limited by your imagination and it reheats so well multiple times. Just store it in a covered microwaveable bowl and pop it in the microwave for 1-2 minutes on 50% power. Stir it and pop it back in on reduced power if it needs a little more heat. The key to making great queso is the cheese. Nothing works better than White American Cheese. It melts perfectly, can be thinned out easily to avoid a skin and reheats perfectly like a good winter blanket. 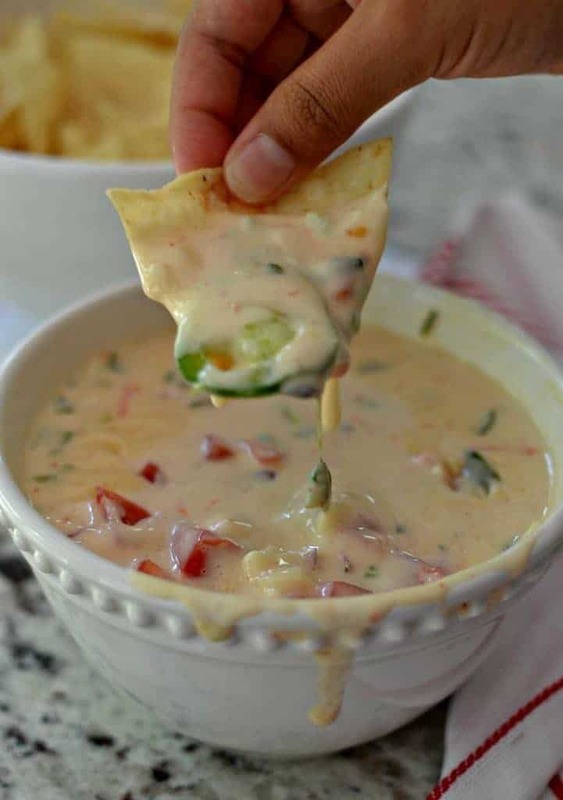 WAYS TO USE WHITE QUESO DIP. As a dip with fresh tortilla or corn chips. Poured over steamed broccoli or cauliflower. Spooned over your favorite omelette, baked eggs, quiche or frittata. Ladled over you favorite burrito or chimichanga. Drizzled over burgers, hot dogs, bratwurst and sausage. 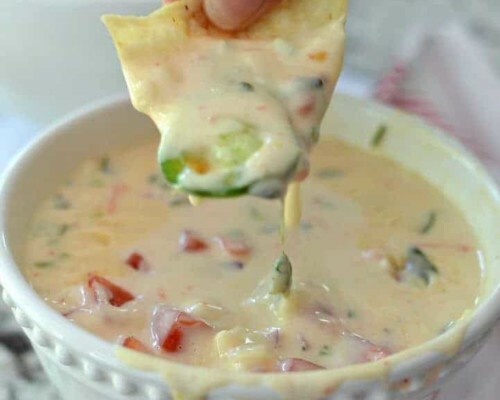 HOW TO MAKE WHITE QUESO DIP. Add a little oil to a small skillet over medium low heat and saute a little chopped onion and minced jalapeno. Turn heat to low and add shredded cheese and milk. Stir continuously until cheese is melted. Slowly stir in enough chicken broth to thin out to desired consistency. Stir in fresh chopped cilantro and finely diced sun ripened tomatoes. HELPFUL HINTS ON MAKING THIS WHITE QUESO EPIC! Purchase good quality American cheese from your groceries deli. It does make a difference. Thin out the cheese sauce using low sodium chicken both. You don’t want it too thick because it will form a skin. Use fresh jalapenos and sun ripened tomatoes. You can add cooked Mexican chorizo, crisp cooked crumbled bacon, chopped chipotle peppers, frozen spinach, finely chopped artichokes and even cooked lobster or crawfish. MORE DIP RECIPES YOU WILL LOVE! Add olive oil to a small skillet over medium low heat. Saute onion and minced jalapeno. Turn heat to low and add shredded cheese and milk. Stir continuously until cheese is melted. Slowly stir in enough chicken broth to thin out to desired consistency. Stir in fresh chopped cilantro and finely diced sun ripened tomatoes. How much does this recipe yield? Recipe reads “10”. Ten what? Serves 10. Makes about 4 cups queso dip. This queso is even BETTER than our local Mexican joint. Thanks so much for sharing! My pleasure Tayler! I am glad that you enjoyed it! 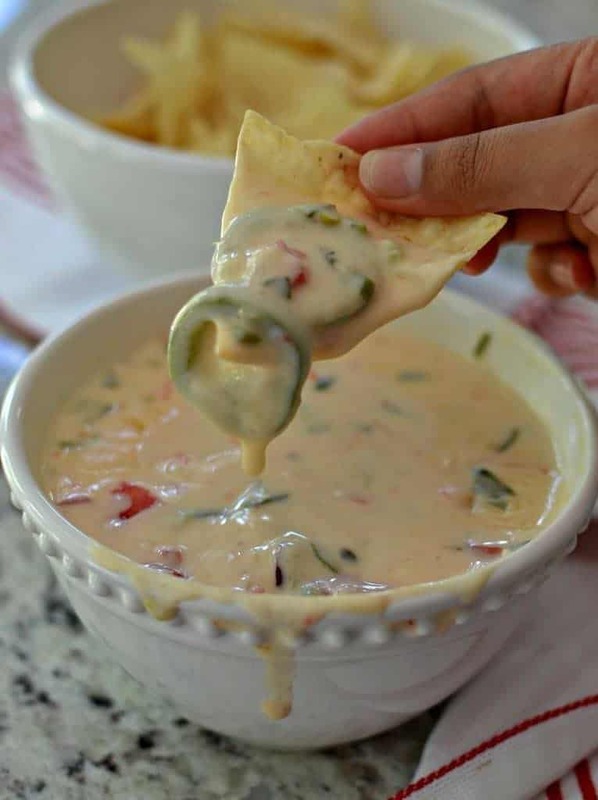 One of my absolute favorite queso dips! Thanks so much Nellie! I am glad that you like it! 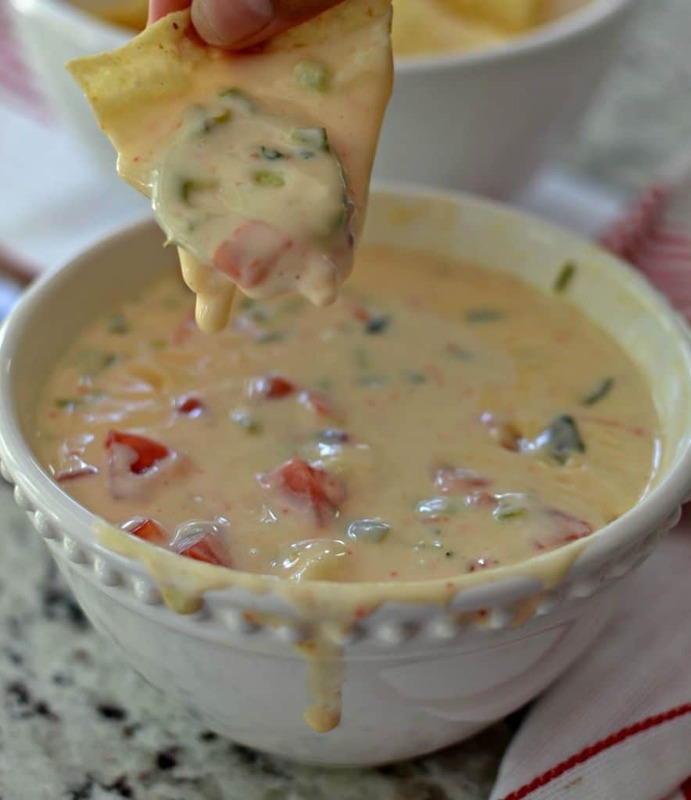 Oh I am so drooling over this creamy queso dip! And just the thought of adding it to broccoli, hamburgers or over eggs has me all excited to whip some up and keep it on hand. Thanks for the delicious inspiration. I was looking for a Mexican White Sauce and I believe that after tasting it..I have found it. This will be great over Burritos or the chips for our supper tonight. Thank you! My pleasure Barry! I hope you enjoy it! !